I think the idea is too simplified. You think the new entrants to cryptotrading dont have to understand the cryptomarket and blockchain? It is written in your WP. I disagree. And many issues like that. And even if you want “to erase borders” - add international team members and advisors. Great Team! Great idea! 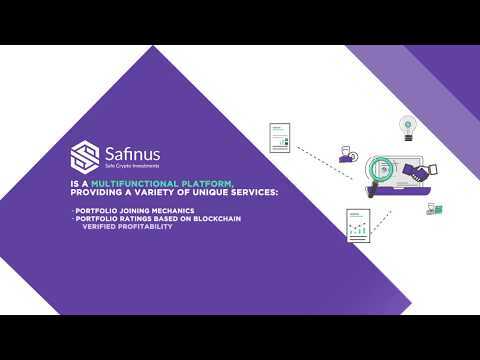 I look forward to seeing what Safinus does. Team looks solid, but no advisory board? There are a lot of projects looking to simplify cryptocurrency investing and combine experienced investors with newbies... but this has a good a chance as any out there if they can get it out fast. Interested in comcept crypto services for the masses downgrading due to lack of kyc . These guys also need to show a working product ! experienced investors can significantly increase the volume of their managed capital, while professional traders and funds can attract new clients on a global scale Proof please ! I love the concept and the vision. As an investor/researcher I understand the level of work involved in vetting ICOs and bringing experienced investors together in a mutually beneficial collaboration. This is tradingview.com signal ideas with perks. The team looks capable, however they lack the experience of reputable international company experience. Providing Facebook links only to provide background summary? Seriously? I recommend either write a summary of your experience on the website or give of Linkedin links. Will update the rating on team when/if this is changed. Needed platform for portfolio investors, rating low for team because of lack of experience in relevant field and no list of good advisers. Project is nice. It will be beneficial for both traders and investors. I think there will be a need for such product. The problem is whether it will get adopted by them. Still, there is this trust issue. You have to make good explanations stating clearly that your platform can be trusted. Not a unique idea, but has a good chance of success if it can be released quickly. Team is lacking international support in the form of a strong advisory board and relevant experience in the blockchain industry. Medium risk investment at the moment, if they can boost their team's international credibility I will review this score. Team looks good, white paper is legible. Team looks solid, would be good to know who their advisors are. It would be good if they included more info in their intro bio. because it doesn't explain how are why they are better or different than others. Interesting project with professional team. The crypt-currency market is still unfriendly to the newbies, so the chances for service providers are still there! Glad to see your efforts on the platform and make it easier to use for experienced investors or the new entrants. Promising project, needs a more international team thought. Never forget about community and create an Ambassadors international team, it is much more useful, than beging Advisors. Not unique idea. Improve your advisory board then ill rereview your project. There is no time to wait, you need to react and involve your service fast. There will be a lot of competitors in this area. Good luck! I think the concept has merit. I would like to see the team’s profiles paired to LinkedIn instead of Facebook to get a better idea of business acumen. I didn’t see any advisers which I think is important. There seems to be limited experience in the crypto and blockchain sphere except for one of the co-founders. I am not real big on bounty programs unless it is used to find security problems and bugs. Telegram community participation fair for pre-ico. Telegram only appears to have one Admin and could use a more personalized approach to new members. Twitter followers fair and Facebook participation above average for pre-ico. Posting on all mediums should be more consistent. The ideas stated above are of my own opinion and is not financial advice. I am not a financial advisor, and this is not a place for the giving or receiving of financial advice, advice concerning investment decisions or tax or legal advice. These ideas and strategies should never be used without first assessing your own personal and financial situation, or without consulting a financial professional. Team needs to update their linked in bio so that investors can know more about the founders. Sounds like ICOBench, taken to the next level. Will have to see how the concept is implemented, and possibly the effect of regulation on ICO's in various countries. Great Idea and project , although not unique, with well diversified team. Nevertheless, a more international and industry specific team, advisors or partners would boost the project's credibility even further. Furthermore, the team's credibility would increase if backed by solid linked in profiles. Yet, I am looking forward to it. Development of the platform's architecture. White Paper and website development. Extended development of the platform’s account functionality (individual portfolio creation for large investors, messaging system, extended trading platform development). Attraction of top traders to the platform. Development of mobile applications for IOS and Android. Integration of traditional stock market instruments into the platform.